Camping may mean getting back to nature, but it doesn’t mean you want to be au naturel in front of your fellow campers. This portable camp shower partition provides welcome privacy when you’re out in the woods. It sets up in minutes, and can be free standing or hung from a tree branch, depending on your shower setup. It can also be used as a clothes changing area. This gives you the privacy... but for the water part, don't forget to bring a portable sun shower found at any camping store. 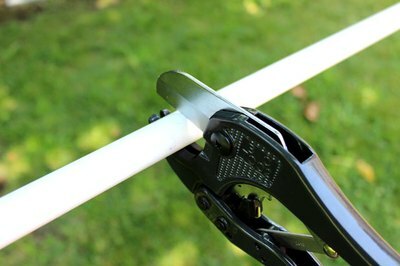 PVC pipe comes in standard 10’ lengths, so you will need to cut them to size using a PVC pipe cutter so you have four 6’ sections and eight 3’ sections. Start with the base of the shower enclosure. 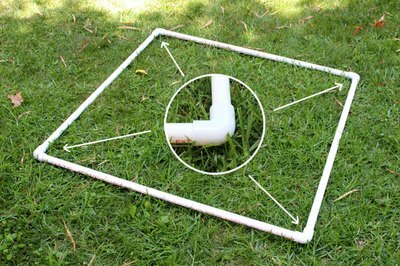 Connect four 3’ pipe sections with four PVC corner pieces. These corners are also called 90-degree side outlet elbows. Attach the four 6’ PVC pipe sections vertically to the corner pieces. 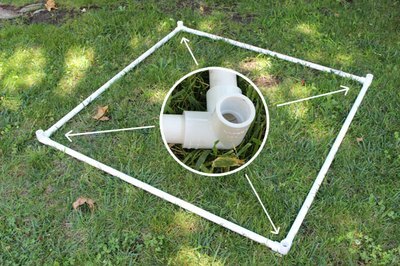 Attach PVC corner pieces to the top of the 6’ PVC pipes and connect the 3’ pipes to them to form a tall cube. The shower enclosure is 6 feet tall. Turn the 6’x8’ vinyl tarp on its side so that it is 6 feet tall as well. 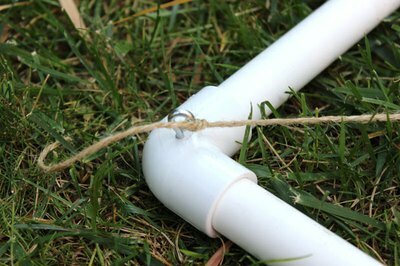 Using the pre-drilled grommets, hang the tarp on the PVC pipes with cable zip ties. Attach the tarp to the vertical PVC pipe as well. 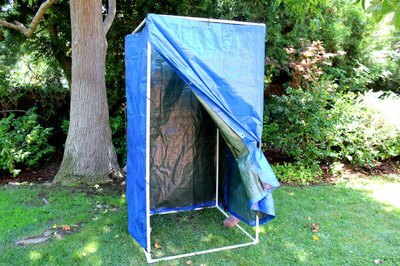 For maximum privacy, overlap the two pieces of tarp so there are no openings. Decide which side will be the opening of the shower enclosure. 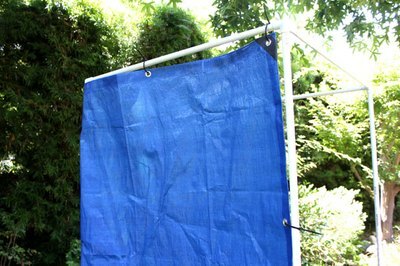 Do not connect the side grommets to the vertical post on this side so the tarp can be opened and closed. 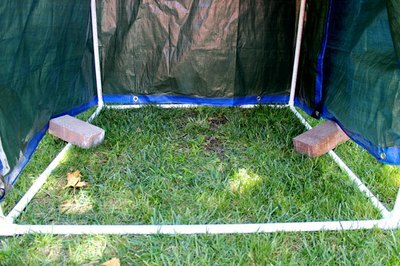 Place bricks or sand bags on the PVC pipes at the base to help keep the structure from blowing in the wind. 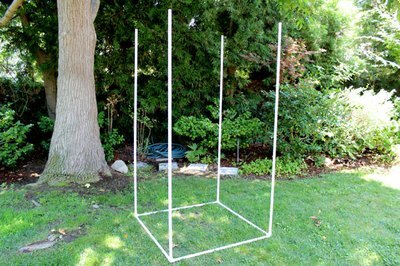 For a hanging shower enclosure, connect four 3’ sections of PVC pipe using PVC elbows. They do not need to be corner pieces because you will not be connecting vertical pieces. Attach eye-hook screws to each of the four elbow pieces, and tie string to the hooks, going diagonally from corner to corner. Without the eye-hook screws, the string can slide off from the elbows. 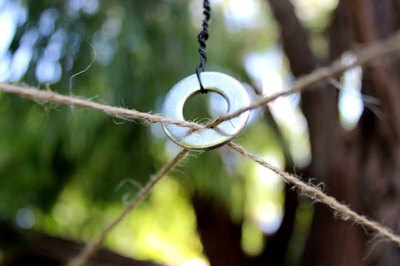 At the intersection of the two strings, attach a metal washer. Tie wire around the top of the washer to hang from a tree branch. 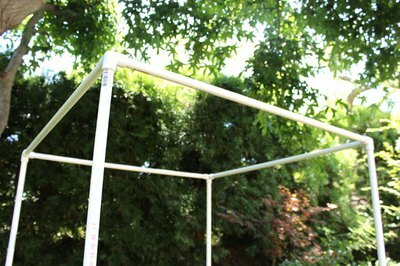 As with the free-standing shower enclosure, hang the tarp from the PVC pipe with zip cable ties. Overlap two tarps to provide extra privacy. The ground in the shower area can get slippery when wet, so place a shower mat in the enclosure. 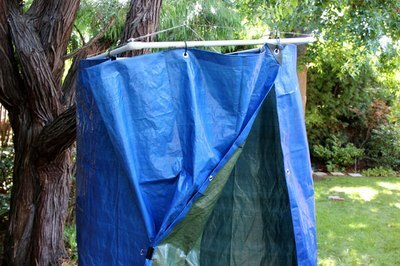 Use a large binder clip to close the tarp from the inside of the shower enclosure.